October 17, 2016 – Jessica Gaskin has an X-ray vision: NASA has appointed her as study scientist leading a team of researchers on a mission to design X-ray Surveyor, a successor to the unparalleled Chandra X-ray Observatory. That is both an honor and challenge for Gaskin, an astrophysicist in the Science Research Office of NASA’s Marshall Space Flight Center in Huntsville, Alabama. Since Chandra’s launch aboard Space Shuttle Columbia and deployment in 1999, the observatory has been one of NASA’s most successful science missions, enabling unprecedented insight into the workings of stars, galaxies, black holes, dark matter and dark energy, and delivering images that continue to thrill the public as well as researchers. “Chandra changed the way we do astronomy,” said NASA Astrophysics Director Paul Hertz on the observatory’s 15th anniversary. Chandra is still going strong in its elliptical orbit up to 86,500 miles (139,000 km) above Earth. But Chandra and its technology are nearly 20 years old, and no other observatories can “see” X-ray emissions with the same resolution and sensitivity. If a replacement isn’t developed, there will be a major gap in scientists’ ability to study the cosmos. For this reason, X-ray Surveyor is one of four NASA missions that will be considered in the National Research Council’s 2020 Astrophysics Decadal Survey — a sort of roadmap or investment guide for future astrophysics research. Whichever mission is ranked first priority by the astrophysics community in 2020 is the one most likely to be funded, built and launched during the following 10-to-15 years. Gaskin and dozens of researchers from around the world are already working on Science and Technology Definition Teams, deciding on the X-ray Surveyor mission’s science goals, its design and size, which instruments will be included and even launch vehicle requirements. Their goal is to deliver a package that convinces the 2020 Decadal Survey’s review committee that X-ray Surveyor should be the top priority. Chandra may be aging, but its eyes are still good. Very good. Surveyor isn’t likely to greatly improve on Chandra’s already amazing resolution, Gaskin said. But the new observatory will be larger and, using 21st century technology, much more sensitive and capable. Surveyor’s spectroscopic and imaging capability will be able to more quickly peer farther and more deeply into space, which is also looking back in time to see the beginnings of stars, black holes and galaxies. Gaskin has been looking up into space since she was a kid growing up with seven siblings in Houston near NASA’s Johnson Space Center. Her father had a bachelor’s degree in astronomy and a master’s in geophysics; her mother was a geologist who worked with lunar samples. There was always a telescope or a textbook around. “Every vacation, we would go out West to look at the stars and the rocks,” Gaskin said. She earned a bachelor’s degree in astrophysics at the New Mexico Institute of Mining and Technology in Socorro in 1995, and a master’s in astronomy at Case Western University in Cleveland in 1998. Gaskin met her husband, Val Korman, at college in New Mexico. When he became a graduate student in optics at the University of Alabama in Huntsville, she moved with him and fulfilled a desire to work for NASA, joining the Marshall Center in 2005. She received her doctorate in physics from UAH in 2004. They have three sons: Jacob, 8; William, 7; and Peter, 5. Over the years, Gaskin has been shifting from astronomy into high-energy physics and instrumentation. 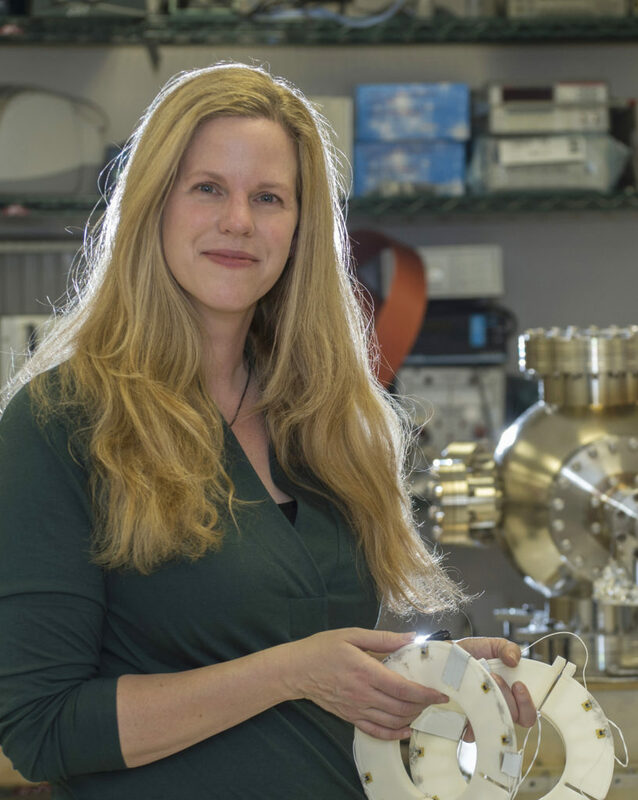 In 2012, she was co-principal investigator on the High Energy Replicated Optics to Explore the Sun, or HEROES, project, which used a balloon to carry an X-ray telescope high into Earth’s atmosphere. The project was selected for NASA’s Hands-On Project Experience, or HOPE, award. In 2014, Gaskin was awarded the NASA Early Career Achievement Medal. Gaskin is proud to be part of the Marshall X-ray astronomy group, which includes Chandra Project Scientist Martin Weisskopf. He is also the senior scientist on the X-ray Surveyor mission, and other Marshall scientists are involved as well. And if X-ray Surveyor is not selected in the 2020 Decadal Review, there’s always 2030.